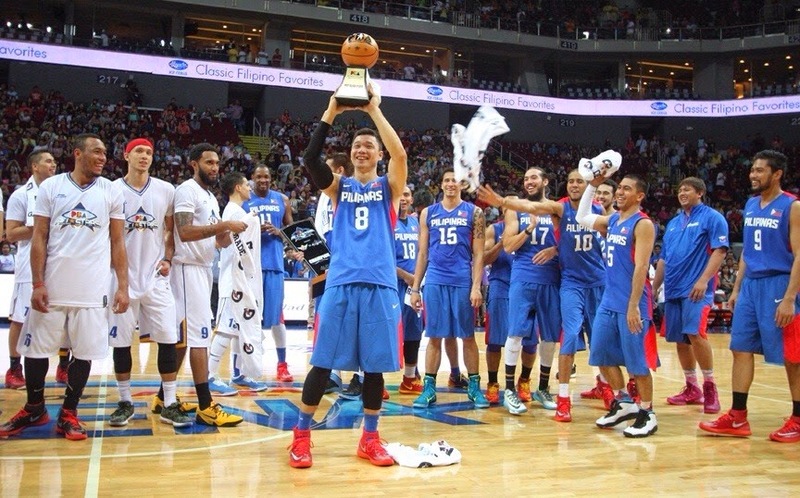 Gary David wins MVP as Gilas Pilipinas beats PBA Selection in All-Star Game 2014 - Balita Boss! Gary David took home Most Valuable Player honors after leading the Gilas Pilipinas to a 101-93 victory against PBA selection during the 25th edition of the PBA All-Star Game at the MOA Arena in Pasay City on Sunday, April 6, 2014. The super scorer shooting guard tallied 15 points including two triples to help the Philippine national basketball team. David sat out the last for minutes but still won the MVP award and also received Php 30,000 cash. Playing for the first time since the silver medal finish at the FIBA Asia last year, the national team also bagged the cash prize amounting to Php 100,000 for winning the exhibition game. Jeff Chan led all scorers with 17 points on 7-of-13 shooting. Jasyson Castro, the best point guard in FIBA Asia 2013, contributed 13 points, five rebounds and two assists. Naturalized player Marcus Douthit scored six straight points to start the half and finished with 10 points. In the third quarter, Gilas players made a deciding scoring run to turn a seven-point lead into 18 points advantage. The third period ended with a score of 82-64 in favor of Gilas. The PBA All Stars selection made a run late in the game to attempt a comeback. A smaller lineup with reigning PBA Most Valuable Player Arwind Santos playing center along with Rookie of the Year Calvin Abueva, KG Canaleta, Marcio Lassiter and Mark Barroca cut the lead to 10 with 100-90 at 2:05 left in the final quarter. But Gilas was not to be denied as they wasted away the time in the final minute. Lassiter led the All-Stars selection with 12 points. PJ Simon and Santos contributed nine points apiece. Gilas shot 49 percent while PBA selection shot 43 percent from the field. The national team, which has been practicing weekly since February, got 26 assists compare to 16 from PBA All-Stars who practiced once before the game. The first matchup at the PBA level between Greg Slaughter and June Mar Fajardo finally happened in the game. Fajardo, the best player of the last conference and the top pick in the 2012 PBA Draft, outplayed Slaughter, the top pick in the 2013 Draft, in the scoring sheet, 13-11. Fajardo added five rebounds and four assists on his stats. Slaughter finished the game with 10 rebounds. Both players began their basketball careers in Cebu, where they developed a rivalry. Though they lost the All-Star Game, the PBA All-Stars selection did not go home empty-handed after they won the Php 50,000 cash prize for the dance showdown before the game. The PBA All-Stars surprised the crowd with Mark Barroca wearing a wig lip syncing “I Love Rock ‘n Roll,” while the rest of the team danced. Joe Devance showcased his booty shaking skill in a dance solo. They ended their performance with their own “Whoops Kiri” dance routine. Gilas players went out first to do their performance. They wear Jabbawockeez-inspired masks and danced with their version of “Whoops Kiri” followed by “The Fox (What Does the Fox Say? )” and “Let it go” for their finale. The All-Star game also served as a “kickoff point” according to Gilas head coach Chot Reyes as they preparing for the FIBA World Cup 2014 and the Asian Games 2014. The PBA All-Stars selection was coached by winningest coach in the PBA and current San Mig Super Coffee Mixers head coach Tim Cone. Mac Baracael, Chris Ellis, Slaughter, James Yap and Barroca started the game for PBA selection. Santos and Abueva lead the seven reserves. Other reserves are Lassiter, Sonny Thoss, Devance, Simon, Canaleta. LA Tenorio, Chan, Douthit, Gabe Norwood, Ranidel De Ocampo started the game for Gilas Pilipinas.